A bone spur in your heel can be a strange and painful ordeal, but it’s not particularly serious. Also known as bone spurs, a heel spur is a little more than a calcium deposit that can cause a protrusion at the bottom of the heel bone. It can feel as though your heel is being stabbed by a pin or a knife. Heel spurs are sometimes a result of plantar fasciitis—a painful condition that causes inflammation of the connective tissues along the bottom of the foot, extending along the foot underneath the Achilles—but they have other potential causes as well. Most bone spurs are not serious and can be treated naturally, allowing you to avoid the inactivity that results from surgery for a bone spur in the heel and its recovery time. What Causes Bone Spurs in the Heel? Bone spurs are quite common in athletes because of the stress they repeatedly put on the area. Running and jumping are likely to result in bone spurs. When you walk, step, or run in way that puts excessive force or stress on your heel bone and the conjoining ligaments and tendons, you are at an increased risk for a bone spur. When you run or jog on hard surfaces such as concrete and pavement, the harder impact puts more pressure on the area and can result in heel spurs. Running on grass or using a treadmill can help fight against this. When your shoes don’t fit or the soles are worn out, more stress is placed in the area and there’s a greater chance you’ll notice a bone spur in the back of your heel. This is especially true of footwear lacking arch support, as well as high heels. The older you are, the more wear and tear your Achilles tendon and heel have undergone. Age also impacts flexibility in the heel and the thickness of protective tissues in the area. The more time you spend on your feet, the greater your chance of developing a bone spur. However, the health benefits of standing opposed to sitting far outweigh the nuisance of a bone spur. When you wear high heels you can develop a painful condition called Morton’s neuroma, which is a thickening of the tissue around the nerves at the bases of your toes. It can lead to pain and numbness along the balls of your feet. Use is the leading cause of heel pain and is most commonly experienced by people who walk heavy (i.e., stomp), carry extra weight, or run long distances. You could be experiencing the effects of a tight Achilles tendon, not a bone spur in the heel. People can develop deep bruises on the fat pad of the heel or the ball of the foot based on stomping or another acute injury. Such pain can feel like walking on pebbles, but it’s not a bone spur. Arch pain is often the result of plantar fasciitis, and it affects the heel and arch of the foot. This pain is especially noticeable when you wake up in the morning and apply pressure to the foot—that is, stand up—after a long period of lying down. Standing after sitting for a long time can also result in this pain. Sharp pains that are repeatedly felt upon standing. If needed, ordering a CT scan or an MRI. If you’re experiencing pain in your foot resulting from a heel spur—or a sore Achilles—it’s smart to relieve the pressure from it. This is best done by sitting down and keeping weight off the foot, and limiting walking, jogging, or standing. Because a bone spur can be formed by pressure and wear and tear, giving your heel a break can help alleviate the pain. One of the first signs of a vitamin B5 deficiency is muscle pain, and one of B5’s primary functions is the production of acetylcholine. Acetylcholine is used to send nerve signals to muscles, while helping you avoid nerve damage and pain resulting from a heel spur. If you’ve got some foot pain or think you have a bone spur, getting some vitamin B5 may help. 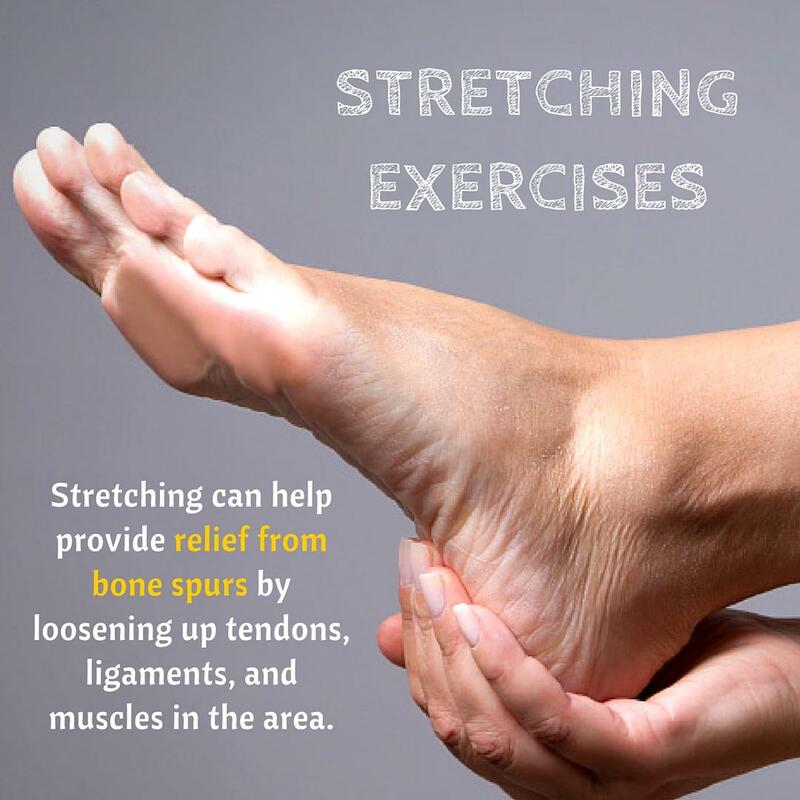 Stretching can also help provide relief from bone spurs by loosening up tendons, ligaments, and muscles in the area. Lean forward with your hands against a sturdy wall with your feet lined up one in front of the other. With your heels flat on the ground, your front knee should be bent slightly and the back one should be straight. Slowly start leaning forward as far as you can to stretch the heel and arch, holding for about 10 seconds. Complete 20 repetitions for the sore foot. 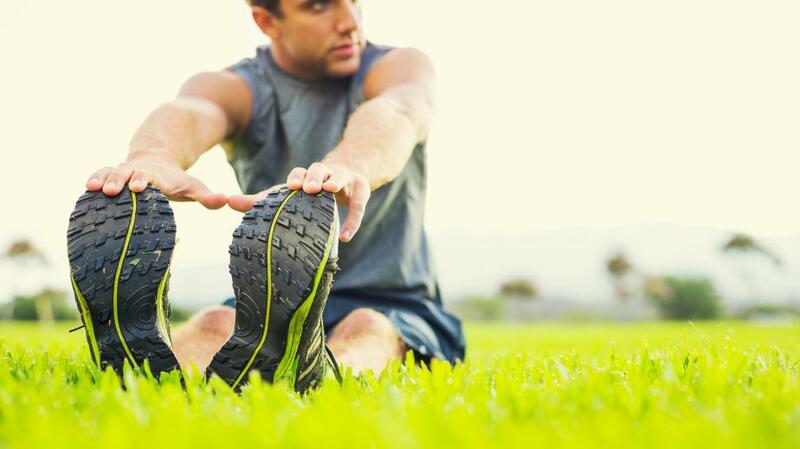 Warm up before exercising to help prevent a bone spur in the heel. What Is the Recovery Time for Bone Spurs to Heal? If you have surgery, it might take three to seven days before you’re able to walk with a protective boot. Usually it will take up to three weeks before you’re able to walk without discomfort. Nine to 12 months may be required for natural treatments. If there is still pain after this time, surgery is recommended. Ninety percent of heel spurs don’t need surgery. There are rarely complications with surgery for a bone spur in the heel, but they are possible. Walking or putting too much pressure on the foot directly after can cause nerve damage. Infection is possible if the area gets wet while the sutures are still in place. Pain may continue if the surgery is not executed properly. Bernstein, L., “Heel spurs,” Web MD, May 22, 2015; http://www.webmd.com/pain-management/heel-spurs-pain-causes-symptoms-treatments, last accessed April 25, 2016. “Bone Spurs,” Mayo Clinic web site, February 27, 2015; http://www.mayoclinic.org/diseases-conditions/bone-spurs/basics/definition/con-20024478, last accessed April 25, 2016.